Remember my paper mice from Halloween? In addition, I finally got to try making tiny little bows on forks that I have seen all over Pinterest. I found the pin that had the most clear cut directions to me and found Stamping with Di. If my instructions aren't very clear, try going to Diana's tutorial. It was simple to follow! So I added the bows to a few of the mice and decided to copy the little mason jar idea Sarah had as well. I picked up some fake snow, battery operated candles, and a cheap evergreen pick while at Michael's buying the ribbon and used some little decorative cups from my Grandmother's house that I had. 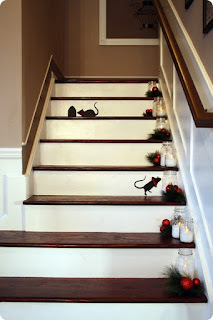 I also picked up some cheap ball ornaments from Target's dollar spot to add in some more red. Here is my staircase for Christmas! Please forgive my dark photos. It was very overcast and rainy when I took them and I am not the best photographer. So far I haven't kicked any of the cups over yet, but that's why I only used 3 - less of a chance for me to do that. What do you think? Cute and Christmasy? Or do the mice creep you out?